Wipeout was a fast-paced sci-fi racer in which you piloted a hovering ship around a track and blew away opponents with a wide array of futuristic weaponry. It was a must have title for the Playstation with high octane action, impressive graphics and a seriously pumping soundtrack featuring the likes of Leftfield and Orbital. The game featured extremely stylish art and from the individual ship designs through to the text fonts everything was super slick and futuristic. It was visually stunning at the time offering a realistic looking 3D race littered with impressive visual effects and a palpable sense of speed. It was developed by Psygnosis and was a release title in Europe often bundled with the Playstation console. First released in 1995 the game was set in the anti-gravity league of 2052 and it was aimed at club going adults rather than kids. Players chose from four teams, with two pilots on each, and every ship handled differently offering the player a tactical choice between outright speed, acceleration and manoeuvrability. 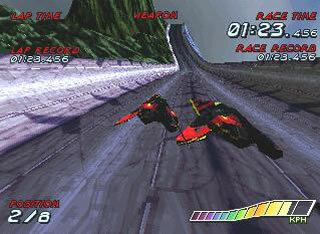 The weaponry and power-ups could be picked up or activated by flying over them on the track and there was a wide range. From turbo boost pads to shields, rockets, mines and missiles players were offered a veritable feast of pick-ups to improve their chances of victory and blow their opponents out of the running. The game-play was excellent, Wipeout offered a visceral sense of speed which was way beyond what had gone before and the competitive destruction of opponents made the game like a grown up version of Mario Kart. Timing your missiles to perfection and hitting those turbo boost pads was often the difference between outright failure and a glorious victory. One of the most impressive things about the game was the soundtrack and while most of the in game tracks were performed by Cold Storage there were also tracks by Leftfield, Orbital and The Chemical Brothers. Sold separately was a different Wipeout soundtrack which included tracks from New Order, The Prodigy, Manic Street Preachers and The Shamen. The publishers were aiming to create a brand and there was even a range of Wipeout club wear. They also cleverly installed the consoles in a number of clubs and allowed revellers to take a break from their dancing and blast each other away on huge screens. The difficulty curve was perfectly balanced and offered a challenge which stopped just short of frustrating although taking bends at g-force inducing speeds you would inevitably wipeout and explode fairly frequently especially if you didn’t learn to master the airbrakes. Damage management was always something you had to keep an eye on and each lap offered the choice of a slightly quicker route or a detour through the recharge zone which was like a futuristic pit stop. Wipeout was great fun single player but you could also utilise the rarely used Link cables to hook up two consoles and go head to head. Sadly there was no split screen option something that was added in later iterations. The progression was quite tough going challenging the player to finish in the top three of each race in order to move forward. 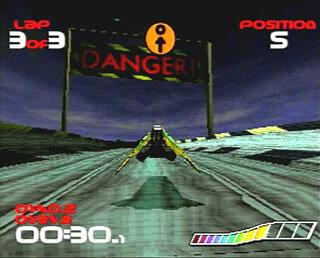 There’s no doubt Wipeout was one of the best titles released for the Playstation and it helped to legitimise gaming for adults. The Playstation with games like Wipeout made it clear that gaming was not just for kids and it showed games could be stylish and stunning with a relevant place in popular culture. It was also a hell of a lot of fun and it still is, although beginning to show signs of age Wipeout stands up pretty well to the passage of time and the series is still running so why not check out the recent Wipeout HD release for the Playstation 3, an enhanced remake of the original which brings it bang up to date.